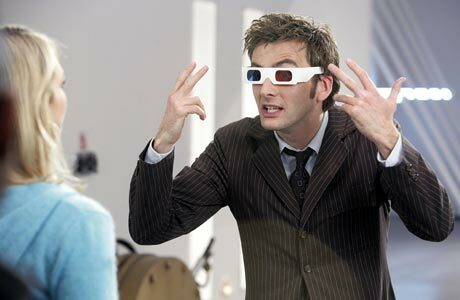 I admit it: I keep a pair of 20-year-old 3-D glasses I got from a comic book in my desk drawer. I brought them to work back in 1997 when the Mars Pathfinder rover started sending back crazy 3-D images of Mars and NASA started posting them all on the Internet. There’s a lot of cool 3-D photography out there on the Web (a lot of it astronomical in nature), and if you’re without your 3-D glasses you’ll miss it, not to mention being unable to detect when a Dalek invasion is imminent. Juicy Bits Software’s $2 iPhone app, 3D Camera, threatens to bring the 3-D image back down to earth. With 3D Camera, it’s easy to create your own stereo images and post them online. 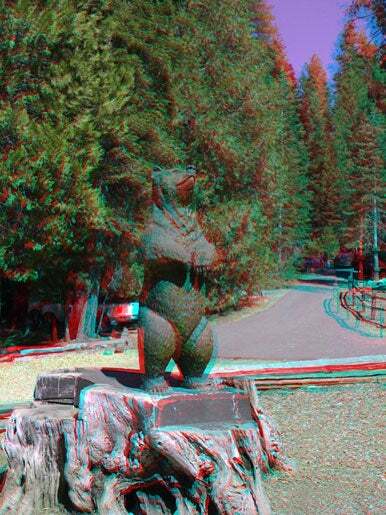 There’s even a stereogram mode that allows you to view 3-D images without any special hardware at all. Defocus your eyes and let the images drift together to view this stereogram as a single, 3-D image. Using 3D Camera is straightforward, though its functionality is hindered by a limitation imposed by Apple. To take a stereo image with your iPhone, you must actually take two shots, both pointed in the same direction but with the perspective moved a couple of inches to the right, to mimic the distance between your right and left eyes. To view this image, you'll need a set of stylish 3-D glasses. Once you’ve snapped two images and aligned them, 3D Camera lets you generate output images in traditional red/blue anaglyph format, as well as the less common gray anaglyph format. 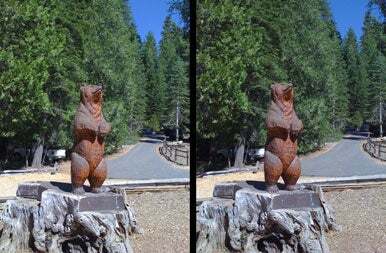 You can also generate a stereogram, two side-by-side images that will appear three dimensional if you cross your eyes and allow the two images to drift together. (You’ve got to learn how to do it.) There’s even a “wigglegram” that quickly alternates between the two frames, giving you a hint of depth without actually being a true 3D image. After you choose what format you want your 3D image in, tapping on the export button will allow you to send it to your Camera Roll for later syncing to iPhoto. You can also automatically post the image to Twitter or send it to Facebook, right from within 3D Camera. 3D Camera does its job and does it well. My only complaints are that it doesn’t upload to Flickr (the photo-sharing service I use), it’s not particularly friendly toward landscape images, and it’s too difficult to take two images that line up properly. The second factor is more the fault of Apple for not giving third-party camera apps more control over how pictures get taken. If Apple could give Juicy Bits Software just a little bit more of what it wants, 3D Camera would be perfect. As it is, it’s still pretty close. 3D Camera is compatible with any iPhone running the iPhone 2.2.1 software update.